The Lower Elementary Cottage: Dr. Seuss Week! 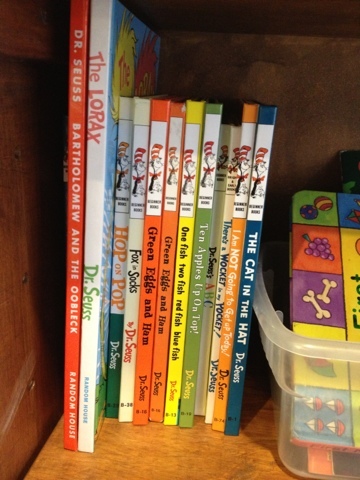 I LOVE Dr. Seuss and it has been a HUGE hit in my class. I've decided that we will be using a new book each day, and doing matching activities for each one. Here is my Seuss section, but I actually bought more at Target today since they are on sale this week. I now also have: The Cat in the Hat Comes Back, and a book with 6 stories: The Eye Book, The Foot Book, The Ear Book, The Tooth Book, The Knee Book, and the Nose Book. It was only $15 for all 7 stories I got today! Yay Target! I take zero credit for any of these ideas. It's all Pinterest and Google finds! This website is AMAZING for totally free lesson plans and printables for a whole pile of Dr. Seuss books! Monday's book was The Cat in the Hat because well...duh! It's the best Seuss book ever! I saw this craft on Pinterest and just HAD to do this! How cute are our Things?! 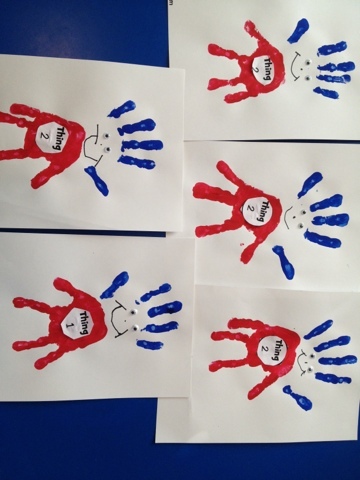 The kids were giggling like crazy as I painted their hands. Love those ticklish little guys! 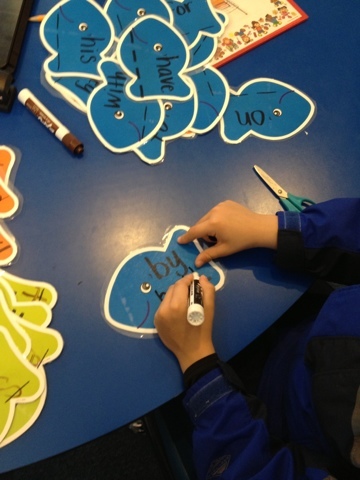 Tuesday's book was One Fish, Two Fish, Red Fish, Blue Fish. We read the book and did a sorting activity with a Venn Diagram of Fish vs. Human characteristics. Totally science related! I just love when fun units overlap really educational stuff! We didn't actually finish our activities thanks to a VERY nutty day in Lower El. Between the blustery day and me coming to school late (thanks to an appointment) it was an afternoon of chaos. I take that back 3 of my 5 were awesome. One was CRAZY and one made me sad. The one who made me said wasn't mean or anything. The poor little guy just shut down. Ugh! It kills me when my little guy gets like this! This student has autism with low verbal skills but a whole huge world in his head he just doesn't know how to talk about. Something was bugging him today and just plain stopped talking, and when he spoke it was gibberish. It took a full hour of prompting and I gave up on traditional methods. I finally held him on my lap and hugged him and he finally said "I'm in a weird mood today." Which is actually a huge verbal expression leap. Hopefully tomorrow is better. 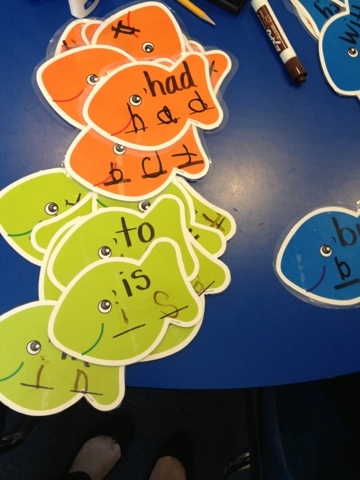 On a totally random note (that my Facebook followers already heard about) this was the funny moment of yesterday: I put out fish cards to practice writing sight words. They are super easy and reusable. It's sharpie marker on bulletin board shapes, then laminated. Kids write with a whiteboard marker and wipe it off when their done. One little guy (kinder) finished early and went to "read" a life cycle book. This is what I heard "First the butterfly poops out eggs. Then a caterpillar is born and eats a lot. Then he makes a cocoon and turns into a butterfly!" Oh geez... at least he learned the life cycle, but I'm pretty sure I NEVER said the "butterfly poops out eggs!" So happy to find a fellow California blogging friend. I LOVE all your Dr. Seuss activities. I am your newest follower!